It’s been awhile since I’ve done a how-to, hasn’t it? Well, a few weeks back I was doing our usual roast chicken and wondered…how many people actually know how to do this from beginning to end? 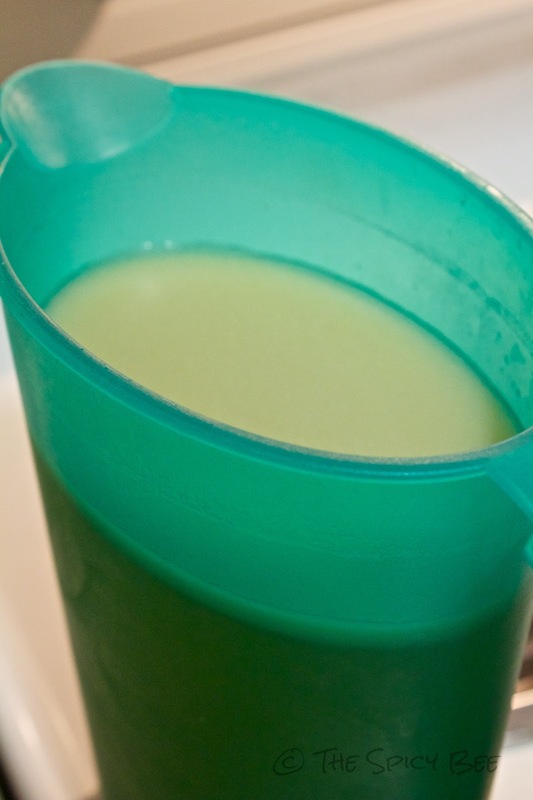 Especially if you’re cooking from scratch on a normal basis–you are missing out on all the free chicken stock! Once I got over the shocking realization, I decided I had to share our method for the betterment of chicken-eating-kind. I will certainly acknowledge that there really is no wrong way to do this–just different habits. 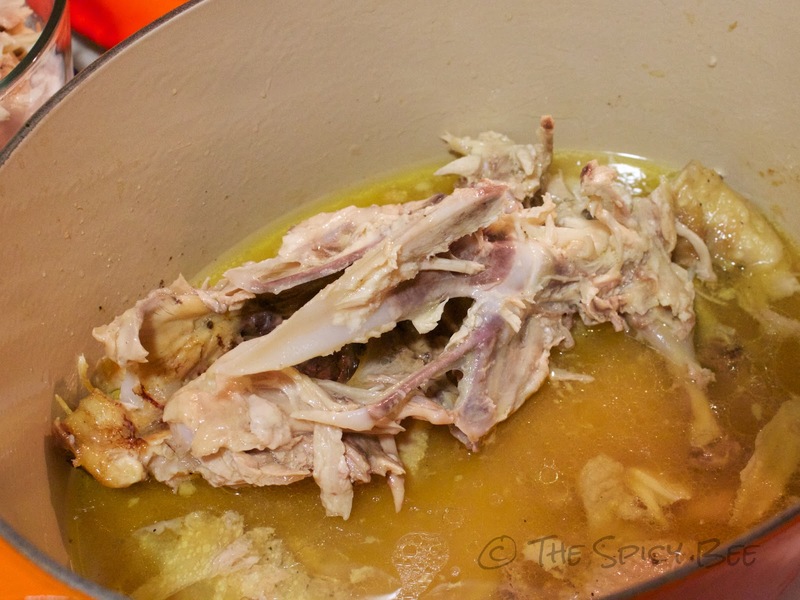 I would love to know–if you do roast, clean, and make stock from your chickens–how do you do things differently? The trickiest part of making roasting chicken is at the start. 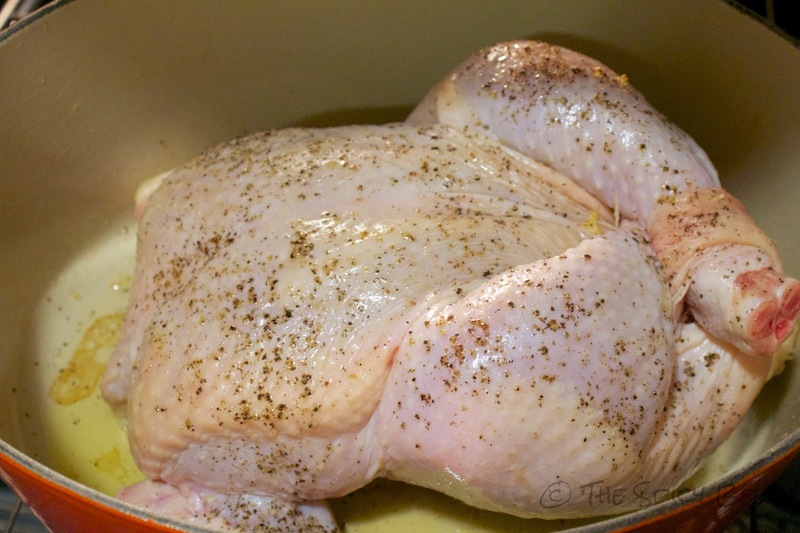 First preheat your oven to 350°F (this is to cook the bird in a covered pan). After you’ve rinsed the chicken, place it into your french roaster, and locate the skin in the inner left thigh of the bird. Using a smaller knife, make a small hole in the skin, making sure to go all the way through to the inside, but not cutting through to the outside. 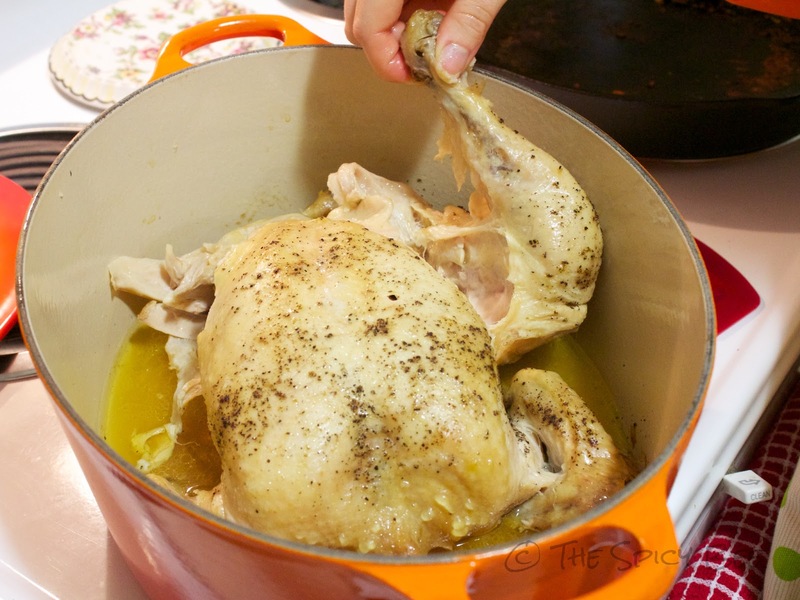 Make that hole a little larger by running a finger in and out, until you can slip the right leg of the chicken through the hole to the outside (as is pictured above). If you want to add the lemon, no better time than now to get it stuffed in the bird. Otherwise, take your left chicken leg, and wrestle it UP and over your right chicken leg, forcing the little bugger to sit Indian-style. Next you’re going to make the chicken look like it’s lounging in the sun by tucking its wings up and back behind its…imaginary head. Rub up the whole bird with your 2 T of oil, and salt and pepper. Don’t forget its back! Bake for 1 hour and 30 minutes. Remember: your time will vary depending on the size of your chicken! If you have a smaller chicken, you’re likely to be done earlier! 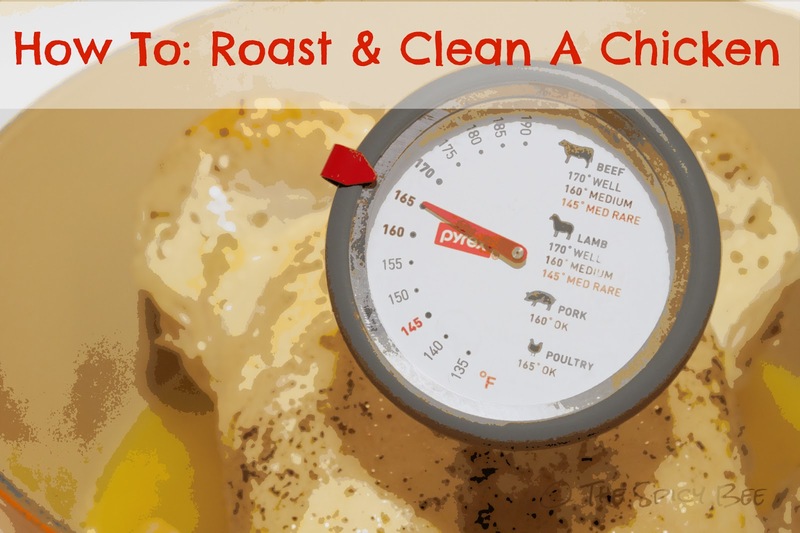 Your chicken is done cooking when your meat thermometer hits 165°F. Give enough time for your chicken to cool a little bit so that you can handle it. Gloves may help, but I prefer just waiting until I can touch it (about 20 minutes). Your chicken will still be hot enough to serve immediately. 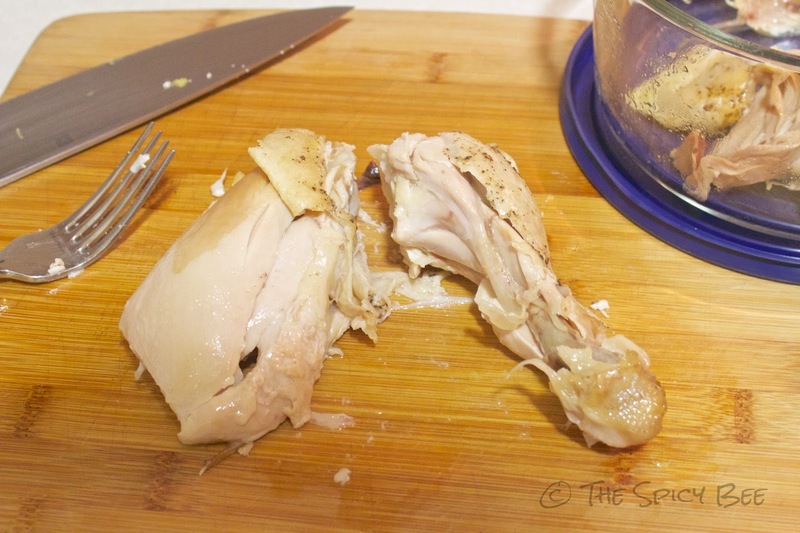 To begin cleaning your chicken, slice through where the thigh meets the body of the bird. Next you’re going to want to separate the thigh from the leg (only if you want to). This is done by locating the …erm..kneecap as it were and cutting just above it. That is the best way I can describe it–it will take some practice to find the sweet spot, but when you do it shall never leave you. Now you can start to cut the breasts from the breastbone. 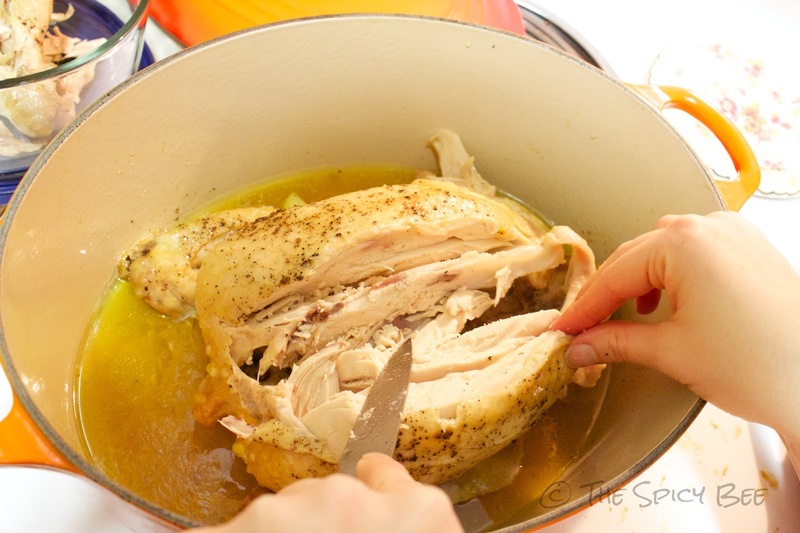 I do this by locating the bouncy, solid center of the chicken, then cutting to the left or right of it downwards, at a slight angle. Do this cautiously, and if you pay close attention, you may feel it skimming across the side of the breastbone. Once you’ve cut done about 3/4 of the way into the bird, you should be able to reach in and just pull and separate (if it’s not too hot! )–from this point you should be able to pick at the chicken until it’s clean. NOTE: Don’t forget to clean the back! It doesn’t seem like there might be much meat there–but there is. Clean as a whistle! You are now left with your chicken carcass! This and the oils around it should now go into your crockpot/slow cooker. That means it’s time for stock ingredients! Once all of your ingredients are in your slow cooker/crockpot, turn it on high for one hour, then turn it to low and let sit for up to 24 hours. Make sure to top off your stock as it will cook down a little bit. We like to cook it for about 22 hours, then turn it off and let it rest until cool enough to pour into a storage container (1-2 hours). Most people like their stock without peppercorns and chicken bits, so feel free to strain it through a fine strainer. This is what the stock should look like after some cool time in the fridge. See that lovely layer on top? THAT’S FAT. YOU MUST EAT IT. Mostly because I say so, but it’s also very good for you. Trust me. We tend to do a roasting chicken followed by stock about every 2-3 weeks. If I were to guess correctly, I would say each stock session yields us about 4.5-5 quarts of stock. One happy accident we had on our first attempt since moving out to Portland was when we realized halfway through cooling that we had no mason jars to store the stock in. We ended up freezing it in ice cube trays, which we now use for recipes that call for small amounts of stock, broth, or water. When not in use, they are stored in a large freezer bag in…where else? The freezer. this really doesn’t seem to bad – mostly just time intensive – I need to do this some weekend! I love that the chicken is kickin back in the sun! haha! Pretty much the same process I use! I usually always freeze the stock unless I have plans to make something in particular. Also, if I make small pieces of chicken for one reason or another I save the bones, or cut up veggies and have ends and pieces, I put them all into the freeze until I have enough for a good stock. I like veggies in my stocks… celery, carrot, onion! YUM.